/ Tugann an Taoiseach Leo Varadkar cuairt ar stiúideonna nua Raidió na Life! 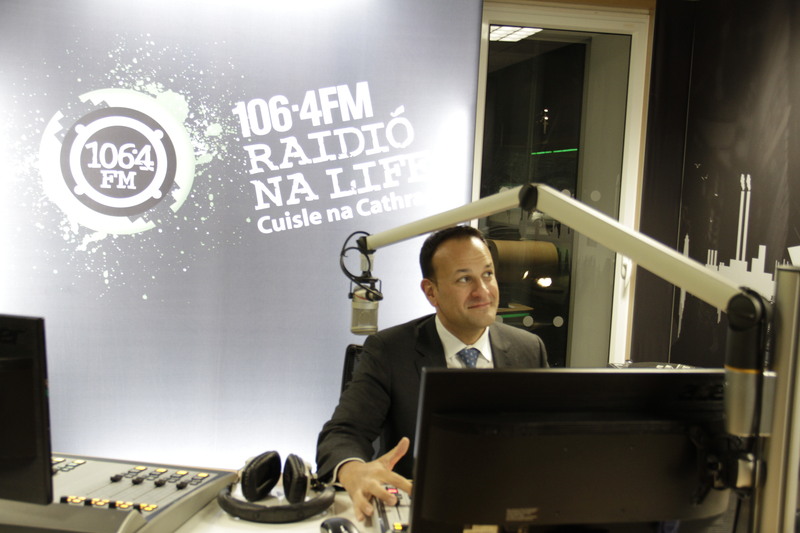 Tugann an Taoiseach Leo Varadkar cuairt ar stiúideonna nua Raidió na Life! Ag ócáid a reáchtáil Foras na Gaeilge oíche aréir, 30ú Eanáir, d’oscail an Taoiseach Leo Varadkar an foirgneamh ina bhfuil oifigí nua an Fhorais ag 63 – 66 Sráid Amiens, i mBaile Átha Cliath 1 go hoifigiúil. Thug an Taoiseach cuairt impromptu ar stiúideonna nua-thógtha Raidió na Life le linn dó a bheith ar an láthair, áit a bhfuil stiúideonna agus oifigí nua an stáisiúin lonnaithe taobh le taobh le hoifigí Fhoras na Gaeilge. Le linn dó a bheith ag tabhairt cuairte ar ár stiúideonna úrnua – nach bhfuil oscailte fós, agus a sheolfar níos déanaí an mhí seo – bhí an Taoiseach ar an gcéad duine le triail a bhaint as an ndeasc fuaime nua i Stiúideo 1. Bhí áthas ar an Taoiseach an deis a bheith aige bualadh le foireann Raidió na Life agus mhol sé go mór an obair den scoth a dhéanann Raidió na Life chun an Ghaeilge a chur chun cinn i mórcheantar Átha Cliath agus seirbhís raidió trí Ghaeilge a chur ar fáil do chainteoirí Gaeilge, idir óg is aosta agus idir chainteoirí líofa agus foghlaimeoirí. Thug sé moladh ar leith don gcur chuige atá ag an stáisiún ó am a bhunaithe chun cláir ar an iliomad ábhair éagsúla a chur i láthair i stíl chomhaimseartha agus fuinniúil a mheallann go háirithe daoine óga agus foghlaimeoirí na teanga le bheith ag éisteacht le raidió trí Ghaeilge.